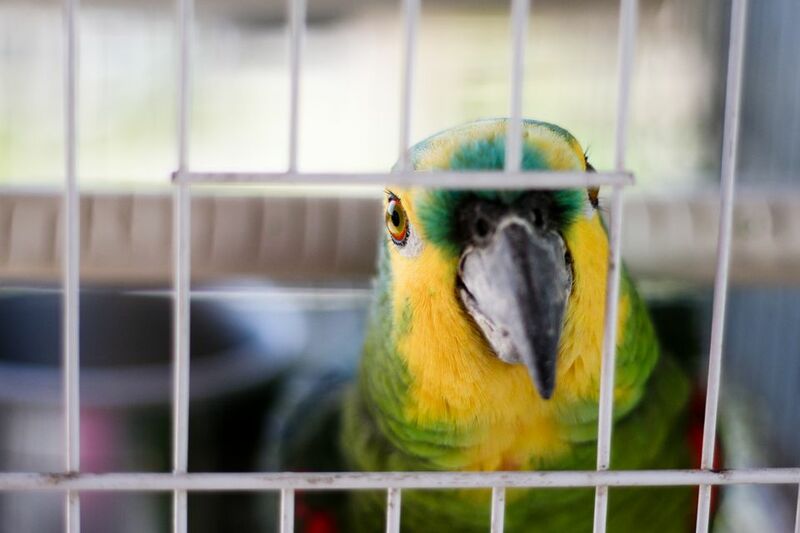 There are many different kinds and sizes of birds that are kept as pets but they all need safe and secure housing. If you don't have a large aviary where your bird can fly freely and safely at all times then you will need a cage for it. Many people and pet stores have the impression that a small bird needs a small cage but this isn't true. All birds need room to play, exercise, explore, and fly, even the smallest ones. Remember that a bigger cage is always better and all birds need time outside of their cage to flap their wings. It is common practice to clip the flight feathers of pet birds rendering them unable to lift off and fly away. There is a lot of debate regarding this practice, with valid arguments on both sides of the fence, but the bottom line is that birds have wings and naturally should exercise them. The above cage sizes are merely guidelines for the specific species but it is assumed that each bird will have ample time outside of the cage to fly or at least flap its wings. If you have a bird with a long tail remember to make sure the cage you choose allows the bird to turn and move around without its tail touching the bars. Feathers will become damaged and birds may start to feather pluck or self-mutilate if they do not have enough room in their cage. Perch placement should also be considered if your bird cannot fly in its cage. Make sure your bird can reach or climb from perch to perch and the water and food dishes are not directly under a perch where waste matter can accumulate. Perches of varying textures, shapes, sizes, and materials should be used instead of wooden dowels and most store-bought perches. Tree branches are not all the same shape or diameter and provide feet with exercise and varying positions in which to perch. Round dowels do not provide the same type of exercise and can cause sores and arthritis in birds' feet.